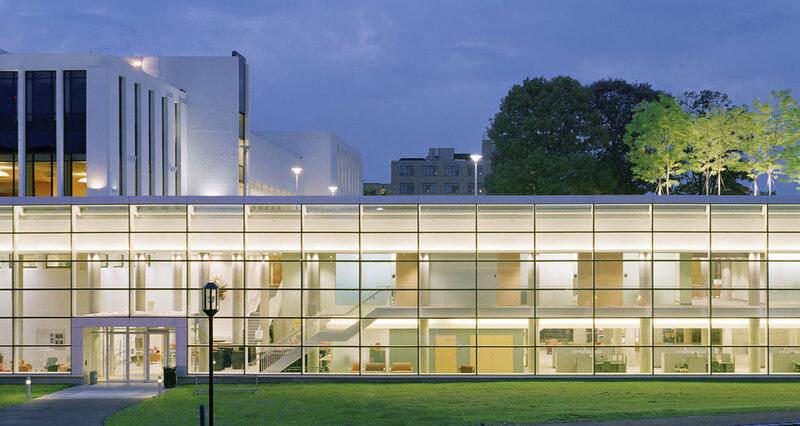 The award-wining addition ties the campus center firmly to the site and to established pathways, allowing the existing 1966 building to become a locus for student activity. The addition offers an inhabitable roof-top lawn for daytime activities and luminous, framed views of students within at night. Program in the addition includes student offices, multi-purpose space, a commuter student lounge, meeting rooms, the campus radio station, and the student mail center. The existing building now houses University food services. When architecture, campus planning, and ecology merge seamlessly, sustainable design becomes effortless. Campus planning requirements dictated a low building volume, so tucking the addition against the existing building and topography made sense. Introducing a planted roof above this long low volume was a logical next step, and had the benefit of replacing rather than removing an existing ground level plaza. Other sustainable elements of the Campus Center include increased stormwater retention, improved insulation, and a series of programmable outdoor spaces.